This factbook is based on the SBC Energy Institute report, Bringing Carbon Capture and Storage to Market, published in September 2012. It summarises the status of existing technologies and the main research and development priorities. 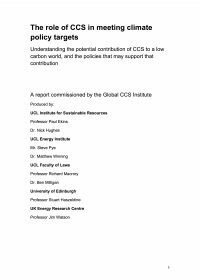 It analyses the economics of the main large-scale demonstration and deployment projects and gives the SBC Energy Institute's view of the future of CCS technologies and projects.